And we are here again, celebrating LOVE on VALENTINE’S DAY! Though not a national festival of any country, Valentine’s day is one the most loved and celebrated occasion around the world. Today is the day to celebrate the most precious feeling ever: LOVE. Now, what does love or Valentine’s Day has to do with English? Well, as I have said earlier, you can find inspiration anywhere and everywhere. For the sake of immense love that I have for the English language, I am taking this opportunity to introduce you all to some idiomatic expressions inspired by the beautiful feeling called love. To fall completely and madly in love. To be completely charmed by someone. If your face lightens up just by the mention of someone’s name then you, my friend, are totally smitten. To find someone very attractive in a way that you start admiring him/her to a great extent. To have strong feelings of attraction or as it’s commonly called, infatuation. Generally, puppy love is the kind of love that you find between school-age children or teenagers. It’s a situation where two or more people praise each other a lot, at times, more than they deserve. Now that’s something lovers do ALL THE TIME. When two people (probably in love) get married (hopefully to each other), you say that they are getting hitched. If there are problems in a relationship, we may say it’s on the rocks. Somebody who cheats on his/her partner. The affection that is feigned in order to obtain something. If there is no love lost between two people, it means that they do not like each other. Well, here’s hoping that no one goes through the tough love and everybody gets all the love that they want. 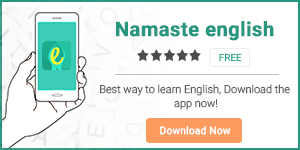 To improve your communication skills, download our English learning app Namaste English. Previous articleAnyway Vs. Any Way: Differences and Usage?